I was invited to participate in a project/tv episode entitled, Vente de Garage, as part of a collaboration between ARTV (a Quebecois television channel) and the Musée d’art contemporain de Montréal. The premise of the television show was to follow the creative process of artists by having them create works using objects given to them by local personalities. The actor, Remi-Pierre Paquin, gave me two Harley Davidson tanks (given to him as a birthday gift to commemorate the year he was born) and an old 8mm camera. From this I made a online posting seeking Harley fans. After communicating with many bikers, I met Pierre Dionne, whose life was so devoted to the brand and the lifestyle that he would use them to hold his ashes when he dies. These two tanks became the urns of Pierre “Lucipierre” Dionne and his partner, Danielle “Demonielle” Yvon. 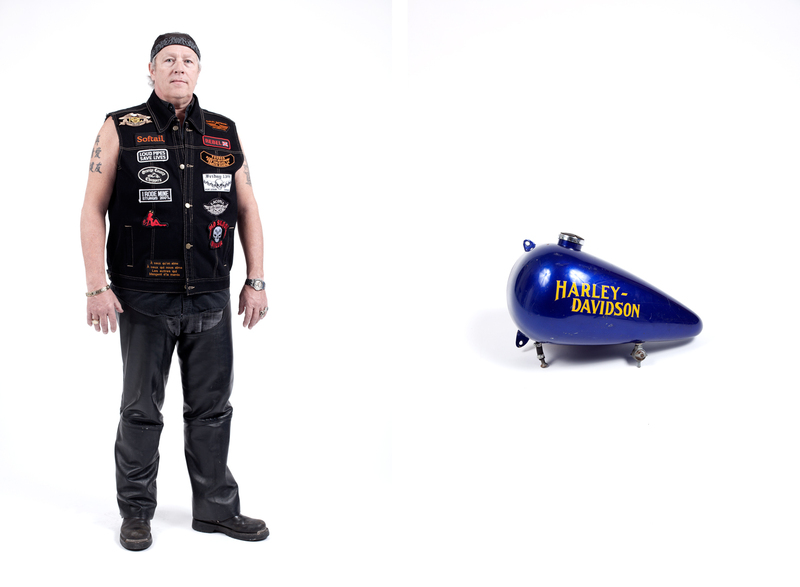 Two life-size diptychs were created and a video loop of a Harley Davidson Show was produced as part of this project.